After receiving an extension, Sarasota County has more time to decommission the wastewater plant on Siesta Key. 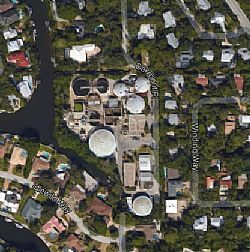 Tucked between one of the largest neighborhoods on Siesta Key and the canopied streets of Winding Way and Oakmont Place, a 4.5-acre sewage plant has been operating for more than 40 years. Sarasota County was supposed to shut the aging wastewater facility down by the end of 2016, potentially replacing most of the land with a waterfront park and smaller pump station. But the project will have to wait another two years as the county works to construct more than four miles of underground pipes and other infrastructure. On Tuesday, commissioners voted to make the mid-2018 date to shut down the facility official.